and today we're talking Blueberry Pie. This is actually the very first and only blueberry pie I've ever made. (and truthfully the first and only photo I took as we hurried out of the house with our pies for Thanksgiving dinner). I've never been head-over-heels for Blueberry Pie and in my mind, blueberry pie is for the Summer...like for 4th of July. And actually here in Florida, our very quick blueberry season starts in April and ends in May...so seasonally speaking, it's more of a Spring pie for us. But...regardless of my personal preference for pie flavors and the fact that fresh blueberries are hard to come by since they are not in season around Thanksgiving, my uncle requested Blueberry pie...and so blueberry pie it was. Blueberry pie is pretty basic...as most pies seem to be. It's made with a lot of blueberries, a good amount of sugar and a little spice. So of course, with the pie being so simple, I decided to dress up my pie a bit by creating a braided and twisted lattice crust pie like one I had been inspired by on Instagram. And I would typically share the link with you because the pie was absolutely gorgeous and amazing but then you'd think less of my own pie. Ha!! One for you and one for a friend...all on the same sheet for printing! Okay, never mind...@thejudylab on Instagram is too amazing not to share with you so I'm swallowing my pride... HERE IS THE PIE CRUST I was inspired by. And here is an awesome Cable Knit Crust she made too! Amazing, right? Although this blueberry pie has nothing to do with my mama or her mama or any other mama I know, "Mama's Blueberry Pie" just sounded so much more appealing and nostalgic. So yeah...I fancied the name up too! 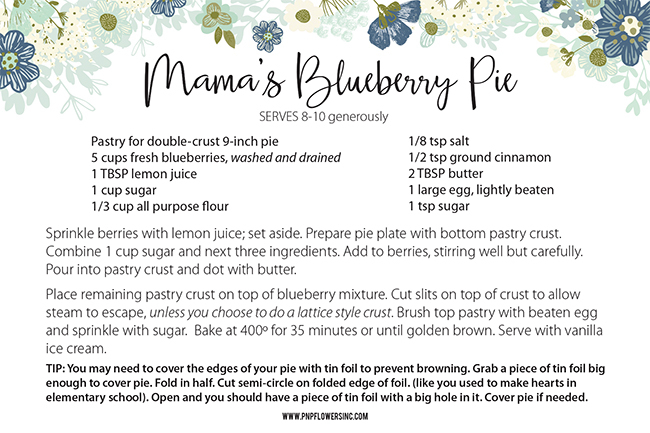 And I think it's okay since this mama right here is the one that baked the pie, photographed the pie and decided to create a cute recipe card for the pie so I could share it with you. So there you go. Ha!! So there you go...even though I increased the flour to 1/2 cup instead of 1/3 cup as suggested by the recipe I was following when using frozen blueberries, it still set up differently than I think it would have had I been able to use fresh blueberries. I'm definitely going to test that theory and report back. 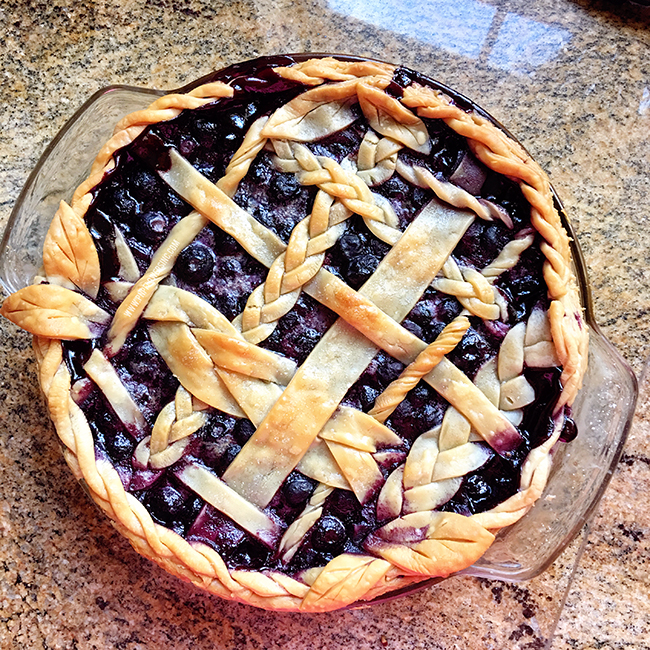 If you love blueberry pie...I hope you'll try this one. I swear it took me an entire hour just to configure the top crust on this pie.